It's been pretty dang warm here. I say warm but I really mean it is HOT. We wake up in the morning and get UNdressed for the day (well...I keep my clothes on)...but that is the kind of weather I am talking about. It's called "warm" around these parts though...for those of us who know what is in store. So...with that in mind, I have been walking around in a lazed out state of mind, because warm weather somehow churns laziness in my body. I want to sit outside and soak up every last minute of this tolerable sunshiny-ness. We've done a thorough job in that, I think. Taking walks around the block in our galoshes just so we can feel like we know the natural rhythm of what spring SHOULD feel like is one of our most recent favorite things to do. We enjoy blankets on the grass with books and fruit. We also like sitting on the outside table with our play dough and making nature prints in it until it starts to represent some kind of blob with growths much like the whales of the sea...only not as pretty. Speaking of which...if you are ever in the mood to make some play dough, kids or not, here is a really great recipe. I think I got this from Josh's mom...and I have been really happy with the results every time. It is fun because not only does the kool aid make fun colors without using food dye but it kind of smells good too! 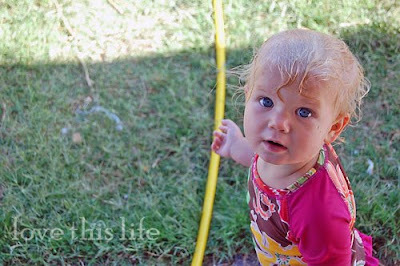 But the most popular activities of all is stripping down and playing in the backyard with the hose. We fill up a lot of buckets and jars, we play in the wading pool, we spray the dog because he LOVES it, we spray each other because we don't love it, and most importantly...we make MUD. Oh yes. This is the "most favorite EVER" thing to do. Asher's most safe and sacred spot is under the tree where the mud is the best for building castles for the bugs. Lucky bugs. The past few days have been really low key and beautiful with just me and my babes. We are incorporating more cadence in our days which is a fun and loose way of saying we are adding some routine! But...the fun kind of routines like jumping on the bed and doing wheelbarrow races. Stuff like that! One particularly lovely view into the fact that Asher has probably stopped napping is that we have this really beautiful quiet hour where we read individual books and turn on some really slow, calming music while Journey takes her afternoon nap. I love it for many reasons. One being that I can sit in whispers with my boy who loves to be loud and watch as he studies large board books and encyclopedia all about animals. Another being that I can read my own books that consistently taunt and whistle at me all day long. I finished up with The Creative Family, I think the same evening that I got it...and now am similarly making my way through Bend the Rules Sewing, which has finally graced my hands. And then there are THE books...the ones that I go over and over with my highlighter until almost every word is jumping out at me. Books that speak straight into life and guide me back. I love those books. There are several of them and since it is warm outside, I am too lazy to list them right now. There is also a lot of list making, journaling, minimizing, and watching movies going on this week. I finally watched Juno...and I loved it to pieces. My mind, true to it's nature, of course is still filling itself up with thought. Thoughts of the future, of what is to come, thoughts of the past, of where did it go? Thoughts of where I am now and how I am walking. We watched the movie "Lions for Lambs" this evening...and I thought it was pretty provoking. There was a monologue by Robert Redford's character in the middle of it where he talked about how we walk into adulthood and don't really realize we are there until several steps into it. He was speaking about what we can do with that and what our courage is to make change in the face of adversity and bull crud. I liked the message and the complexity of the challenge. For some reason it touched on things I was already pondering throughout the day. And then, noticing that I was getting a little wrapped up in my longings and a little too uncomfortable with my shortcomings and a little too dissapointed in the reception to my efforts of making conversation about it all...I decided to think about when I was most alive today...meaning...when were my sense most aware, when did I feel a connection to what was all around me, almost to the point where there was no distinction of separation. 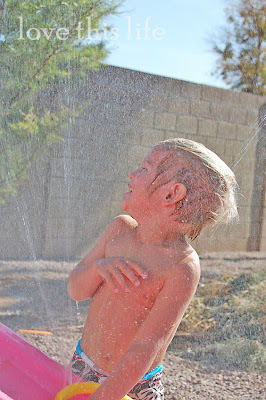 Well...of course, it was outside...with the hose, the mud and the beauty of laughter. 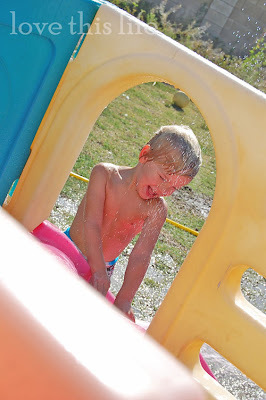 beautiful thoughts, once again....the mud thing....when cassie was here, asher told her he wanted to make mud.....guess nonnie is going to have to find a "mud" place.....just so nonnie and papa's bugs can have castles too! Oh what a wonderful post! I think some of my favorite times are when Wyatt and I are outside at the park just calming down and enjoying nature. I love spending time at your house in your backyard watching the little kiddos! I love you Jess and I love the momma that you are! i am proud of you for stopping- just in time- to congratulate yourself for something you did THIS DAY. not for what you want or who you wish...just for this day, what you DID. good job my little sis. Seriously, could your babies be any more adorable!